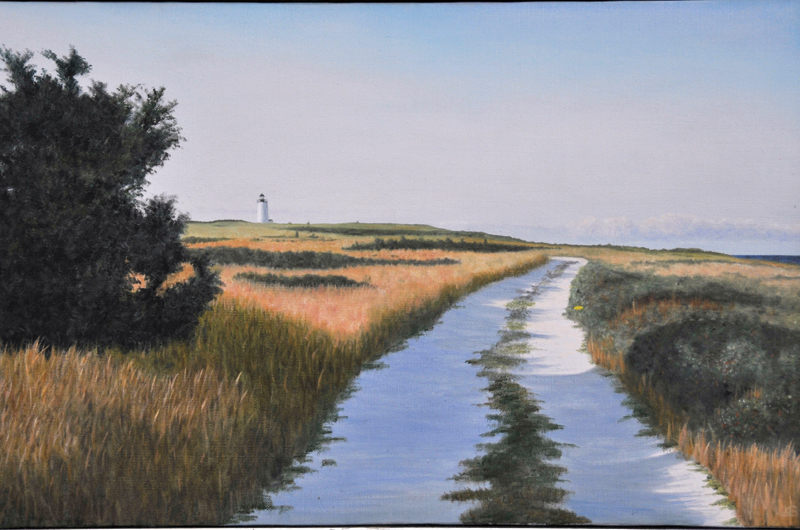 Kib Bramhall, Road to Cape Pogue, oil on linen, 13 x 21 inches, 1982. Yogi Berra once reportedly said, “When you come to a fork in the road, take it.” If applied to the road to Cape Pogue on Chappaquiddick, Yogi’s advice would make perfect sense: no matter what fork you take, this road draws you along with the promise of fishing adventure. The road – perhaps more accurately called the trail – starts with a left turn after crossing the Dike Bridge and runs due north to the lighthouse and then southerly until ending at the Gut. There are several forks along the way, any of which lead to good fishable water. On the left is Cape Pogue Pond and its bait-filled waters that hold stripers and bluefish from May to November. On the right is East Beach, the jetties, and Arruda, all hot spots. At the northern tip is the lighthouse and the boulder-strewn water where Cooper Gilkes, Bruce Pratt, and others caught numerous fly-rod stripers in the thirty-pound class in the early 1980s. At trail’s end is the Gut, that tide-swept opening between Cape Pogue Pond and Edgartown’s outer harbor that is famed for its spectacular blitzes of false albacore and bonito as well as Derby-winning striped bass and bluefish. And don’t overlook the stretch of beach between the lighthouse and the windmill house. That’s where I beached a fly-rod-record forty-three-pound striper years ago. The road to Cape Pogue is breathtakingly beautiful, winding through an unspoiled landscape of dunes and heather and cedar trees, always with a water view of salt marsh, Nantucket Sound, and/or Cape Pogue Pond. It is owned and maintained by The Trustees of Reservations (TTOR), which is the oldest regional land trust in the world. They protect 116 properties totaling 27,000 acres in Massachusetts, all of which are open to the public. There are more than 125,000 dues-paying members, many of whom are fishermen whose access to Cape Pogue, Wasque, and other Chappaquiddick beaches is made possible because of TTOR’s stewardship. Off-road vehicle beach permits and stickers may be purchased at their office in Vineyard Haven, at Coop’s Bait and Tackle in Edgartown, at the county office at the airport, and at TTOR entry points on Chappy. TTOR also owns reservations at Long Point, Menemsha Hills, and the Brickyard, all classic examples of the Vineyard’s natural beauty. Paul Schultz, who worked for TTOR for more than twenty years as a beach ranger, fishing guide, and assistant superintendent, took the correct fork one fall night in 1986 and caught a fifty-one-pound striper all the way at the end of the road at the Gut, perhaps the record bass from that location. Fishing with Paul Schultz was a great opportunity!